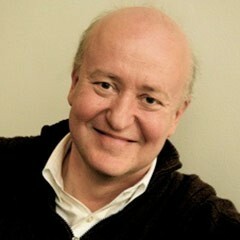 Tim Page is a professor at both the Thornton School of Music and the Annenberg School for Communication and Journalism at the University of Southern California. Page won the Pulitzer Prize for criticism in 1997 for his writings about music in The Washington Post, where he was the chief music critic from 1995-1999 and 2001-2007. Before that, he served as the chief music critic for Newsday and as a music and cultural writer for The New York Times. During his years in New York, he was the host of an afternoon program on WNYC-FM that broadcast interviews with hundreds of composers and musicians, including Aaron Copland, Elliott Carter, Dizzy Gillespie, Philip Glass, Meredith Monk and Steve Reich. Many of these are now available on-line. An interview with Glenn Gould, comparing the pianist’s two versions of Bach’s Goldberg Variations, was released as part of a three-CD set entitled A State of Wonder in 2002 that became a surprise best-seller. Page was a finalist for a Grammy Award for his liner notes for the recording. His books include The Glenn Gould Reader (Alfred A. Knopf, 1984), Selected Letters of Virgil Thomson (Summit, 1988), William Kapell: A Documentary Life History of the American Pianist (IPAM, 1992), Music From The Road: Views and Reviews 1978 – 1992, an anthology of previously published work (Oxford University Press, 1992), The Unknown Sigrid Undset (Steerforth, 2001), and Tim Page on Music (Amadeus Press, 2002). He is the author of the official history of Carnegie Hall (“Carnegie Hall Treasures” 2011) and a memoir of his childhood, “Parallel Play” (2009). He is the biographer of the American novelist Dawn Powell and also collected her diaries, letters, short-stories and plays for publication. He received an Honorary Doctorate in Fine Arts from the University of Connecticut in 2005, has been a juror for the Pulitzer Prize on five occasions, won the ASCAP Deems Taylor Award five times and was presented with the Glenn Gould Honors in Toronto. He has edited four volumes for the Library of America — the novels of Dawn Powell (2001) and the writings about music of Virgil Thomson (2014, 2016). He delivered the Blashfield Address at the American Academy of Arts and Letters in 2001, the Louis C. Elson Memorial Lecture at the Library of Congress in 2006 and the John Cage Centennial Address at the University of Colorado in 2012. He is currently a regular contributor to the New York Review of Books.